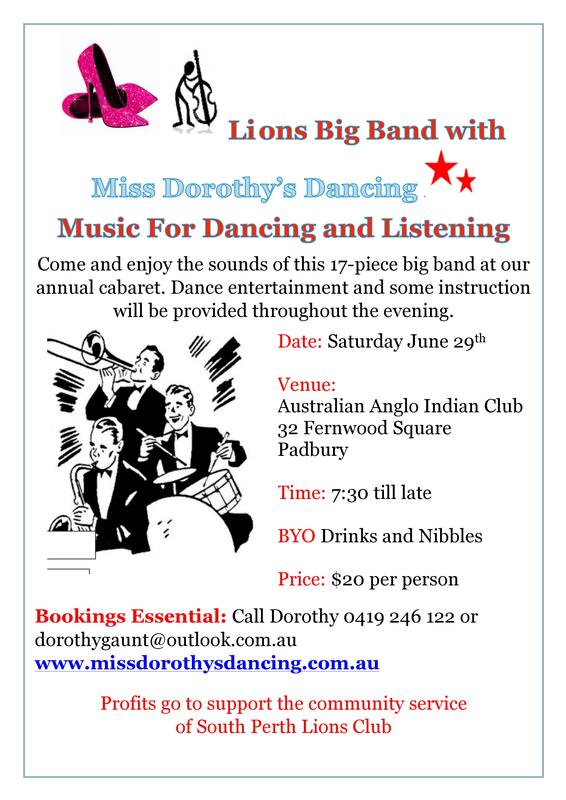 Miss Dorothy’s Dancing presents a fabulous Cabaret Evening of live dance music played by the South Perth Lions Big Band! Come along and enjoy ballroom dancing the way it originally was! Glory in the magical sound of a full big band with our great singers, under the baton of talented jazz musician Phil Hatton. Imagine Benny Goodman at the Savoy… Glenn Miller at the Glen Island Casino… Duke Ellington at the Cotton Club… and Jo Loss at the Hammersmith Palais! Booking is essential – contact Dorothy Gaunt on 0419 246 122 or dorothygaunt@outlook.com.au to reserve a table. Profits go to support the community service of the South Perth Lions Club.